You find th em difficult. You’ve tried ignoring them, but they just won’t go away. Infact you’ve noticed that Difficult Person is becoming even more prickly than usual. So what do you do? Stages 1 & 2 of our Dealing with Difficult People model explain the importance of first observing and understanding what might be causing the situation with your difficult person – What’s going on for you and them, as well as assessing the options open to you. 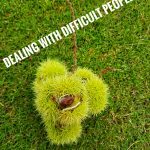 The 3rd phase of our Dealing with Difficult People model comes into play when you have taken the decision to address those prickles! Your “Difficult Person” Are you giving them your full attention? Are you listening? Use I statements: What I’ve noticed is… My perception is…. And accept that Agreement is a position that is acceptable to both parties even if you don’t think it’s ideal! We find it works. Why don’t you try it out for yourself, and please do let us know how you get on with it the next time you are faced with your own difficult person!